Often do we think how a simple saree blouse can be styled in a different way. Well we have the answer and believe us you are going to love it…. Long floor length jacket-Your plain border saree’s will look completely different if you pair them with a long floor length open jacket. 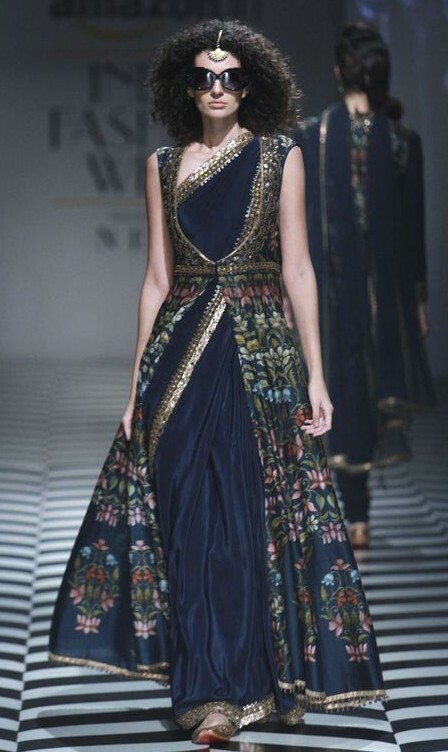 This cut is so apt to wear with a saree and looks truly graceful. Broad yoke gives the palla space to be seen, and the panel style brocade at the bottom adds a texture to the otherwise simple saree. Choose the color and the texture of the Jacket wisely, like you can pick the base color similar to the color of the saree so that the jacket doesn’t overdo the look. Also if you are short heighted then refrain from selecting big and bold patterns. The front open cut will ensure that you have enough leg space to move freely and to flaunt your saree. V cut shrug– A velvet V cut shrug is a good addition for a fusion look. 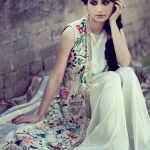 It goes well with saree’s in light weight fabrics like net, chiffon, Georgette’s. 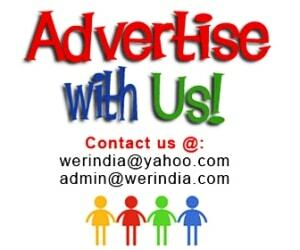 You can alternatively have a light embroidery done on it as well. Achkan style jacket– Thigh length Achkan style jackets are so much in fashion. The style varies from waist to knee length and is done in a band collar style. You can go for full sleeves or 3/4th sleeve style. Structured jacket– Your Bandhani’s and Patola saree’s can make a comeback in this avatar. 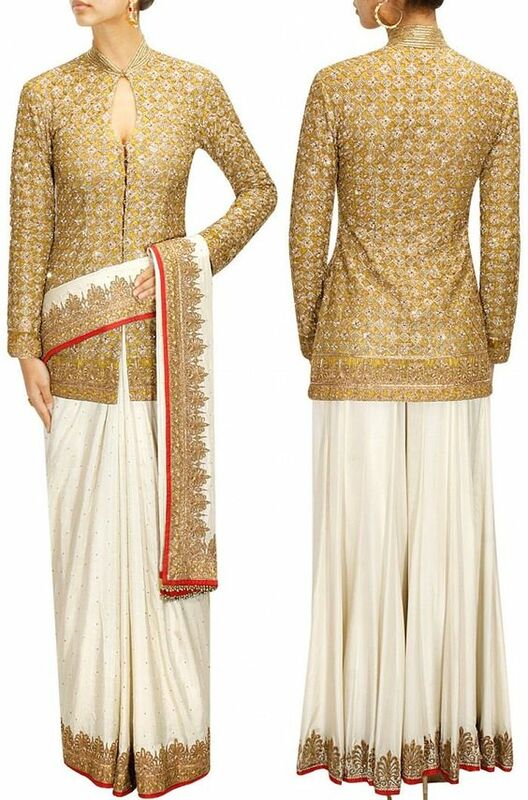 Borrow the jacket from your pansuits and wear it with a saree, believe us you will make many heads turn wherever you go. You can also try a seedha palla style with this look. Replace the blouse with a simple bandeau or a crop top. 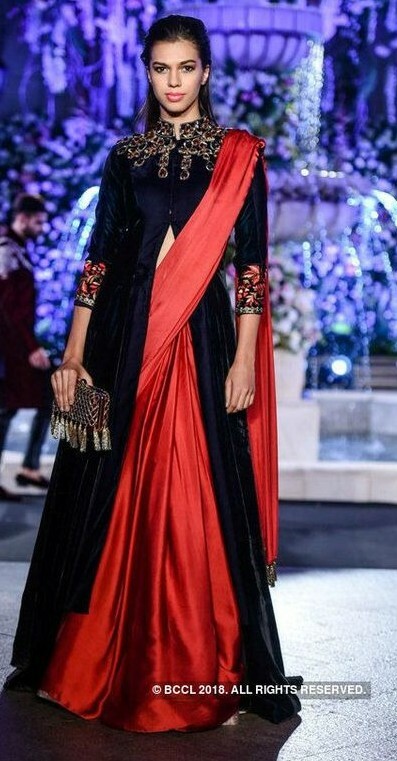 Velvet Kurta’s– Long embellished jacket style anarkali’s and front open kurta’s can also be paired with saree’s done in softer and drapable materials like satin, chiffon silk and Georgette’s. Multicolor Shrug– Plain sarees can also be teemed with shrugs in bright shades. Best would be to wear them with an embellished multicolor shrug.